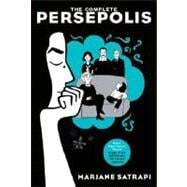 Satrapis groundbreaking two-part graphic memoir of her unforgettable girlhood within a large family in Tehran during the Islamic Revolution--now available in one volume--has been transferred to the big screen in a major animated film from Sony Picture Classics. Marjane Satrapi was born in Rasht, Iran. She now lives in Paris, where she is a regular contributor to magazines and newspapers throughout the world, including The New Yorker, and The New York Times. She is the author of Embroideries, Chicken with Plums, and several children's books. She cowrote and codirected the animated feature film version of Persepolis.